What is it about photo editors’ obsession with inked fingers? After seeing dozens of the purple digits being offered to the camera, I want to scream “out, damned spot” and do a post on something sane–like fashion week. It is just when the media are caught up in a new craze, however, that older habits can be revealed. This might be the paradigmatic inked finger photo. In the foreground, direct physical evidence of democratic participation; in the background, display of the traditional, nondemocratic society that is being brought into modernity by the electoral process. 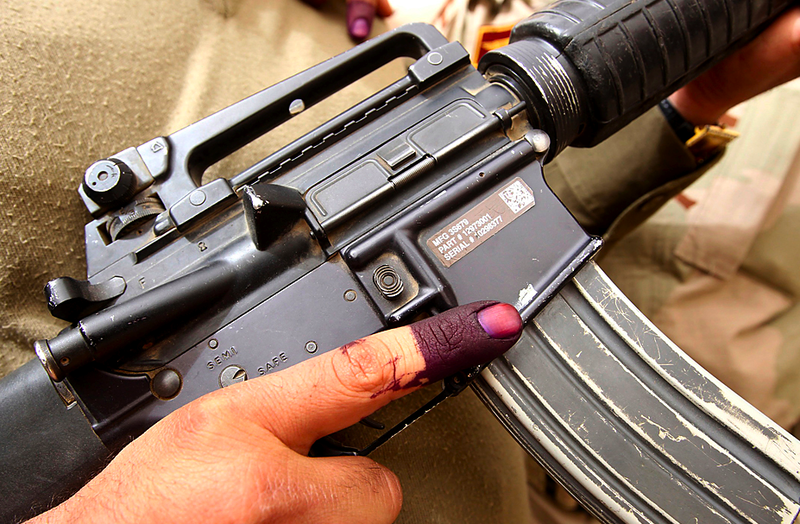 The symbolism is comprehensive: the finger signifies an individual voter and perhaps liberal individualism; the ink implies both institutional legitimacy (one person, one vote, via reliably transparent procedures) and the manner in which democratic identity might become a second skin, voluntarily painted onto the flesh. Likewise, the individual is otherwise wrapped in that society’s depersonalizing and oppressive traditions. Thus, these highly gendered and Orientalist images of veiled women are particularly useful for maintaining Western mythology about colonial occupation. The US is (and always was) there to provide democracy and other forms of emancipation, which occur when the client nation adopts Western procedures on their belated march into modernity. Even if this were true, those in the occupation zones have always been able to see that there is another dimension to the story. The second side of modernization is revealed in this photo of another inked finger. 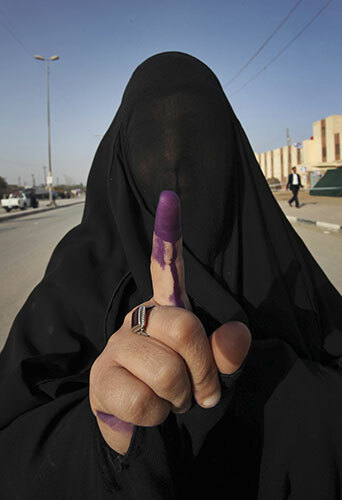 “I VOTED” began the caption for this photograph of a member of the “security personnel” in Iraq. Yes, he voted, and he also locked and loaded. Once again, we have the finger set against a backdrop, but instead of traditional costume we see a machine of the national security state. Now democracy goes hand in hand with military force. Of course, elections do need to be protected from disruption, and the state is to have a monopoly on violence, but this image of militant democratization may imply that the election is a temporary ritual while the projection of military power will remain the constant feature of national life long after the dye has washed off. More telling is the lettering on the gun: all in English, it reminds us that the weapon was bought from-and very likely paid for by–the US. “I voted,” but the US equipped, and this election cannot escape the fact that it is still being conducted in a country stocked with US troops and on the US payroll. The first image implies (falsely) that Iraq’s past was one of traditional Islamic repression. The second image exposes its present condition as a client state. One might hope that there can be a third alternative for the future. Photographs by Alaa al-Marjani/Associated Press and Mohammed Ameen/Reuters.